^ Sambidge, Andy. "Qatar Airways' First A350 Completes Maiden Test Flight." Arabian Business, 19 Oct. 2014. Web. 19 Oct. 2014. ^ "2017 price adjustment for Airbus’ modern, fuel-efficient aircraft"
^ Taking the lead: A350XWB presentation (PDF). EADS. December 2006. （原始内容 (PDF)存档于27 March 2009）. ^ 5.0 5.1 5.2 5.3 5.4 5.5 Airbus O&D. Airbus S.A.S. 28 February 2018 [11 March 2018]. ^ "Airbus to launch Boeing 7E7 rival." BBC News. 2004年12月10日. ^ "Airbus claims agreement in principle for A350 funding." Flight International. 2005年9月16日. ^ "Airplane kingpins tell Airbus: Overhaul A350." Gates, D. Seattle Post-Intelligencer. 29 March 2006. ^ "Redesigning the A350: Airbus’ tough choice 互联网档案馆的存檔，存档日期2009-03-27.." Hamilton, S., Leeham Company. ^ "Singapore Airlines Says Airbus Needs to Make A350 Improvements." Michaels, D. and Lunsford, J. L. The Wall Street Journal. 7 April 2006. ^ "Criticism prompts Airbus to study options, CEO says." Rothman, A. Bloomberg News. 11 April 2006. ^ "Airbus Considering Improvements to A350 互联网档案馆的存檔，存档日期2006-05-24.." Associated Press. 10 April 2006. ^ "Pressure mounts following attack by Emirates." Brierley, D. The Independent. 18 June 2006. ^ "Airbus Unveils New A350 to Take on Boeing's 787." www.bloomberg.com. 17 July 2006. ^ 15.0 15.1 Kingsley-Jones, Max. PICTURES: Airbus unveils mock-up of A350 XWB cabin. FlightGlobal.com. 2007年9月28日 [2013年8月26日] （英语）. ^ Thomas, Geoffrey. No GP7000 for A350 XWB-1000. atwonline.com. 8 March 2007 [23 May 2011]. ^ Singapore Airlines orders 20 Airbus A350 XWB-900s and 9 Airbus A380s 互联网档案馆的存檔，存档日期2006-07-23. ^ Cathay Pacific’s first A350 arrives in Hong Kong. www.cathaypacific.com. [2016-05-31]. ^ Lufthansa takes delivery of its first A350 aircraft. Airbus S.A.S. 2016年12月21日 [2017年8月22日]. ^ Malaysia Airlines takes delivery of its first A350 XWB. Airbus. [2017-12-27]. ^ Malaysia Airlines Receives Second A350 XWB. NST Online. 2017-12-24 [2017-12-27] （英语）. ^ Orders and deliveries. Airbus. [2018-12-22] （英语）. ^ Airbus Family Figures (PDF). Airbus. Sep 2017. ^ "Airbus launches new Ultra-Long Range version of the A350-900"
^ A350-900ULR: Singapore Airlines could be the sole customer. CentreForAviation.com. CAPA Centre for Aviation. [2019-02-27]. ^ "Singapore launches lower-weight 'regional' A350"
^ Airbus 2007 results. Press centre (新闻稿). Airbus S.A.S. 16 January 2008 [19 August 2013]. ^ Airbus 2008 commercial results. Press centre (新闻稿). Airbus S.A.S. 15 January 2009 [19 August 2013]. ^ International Lease Finance Corporation concludes revision of its original 16 aircraft A350 order to 20 A350 XWBs. Press releases. Airbus S.A.S. 26 October 2007 [30 December 2013]. （原始内容存档于30 October 2007）. ^ ILFC orders Rolls-Royce Trent XWB in $800M contract. Rolls-Royce. 7 November 2007 [30 December 2013]. （原始内容存档于21 November 2008）. ^ Afriqiyah Airways confirms order for six A350s. Press releases. Airbus S.A.S. 10 December 2007 [16 December 2013]. （原始内容存档于11 December 2007）. ^ Afriqiyah Airways places firm order for four more A350 XWBs. Press releases. Airbus S.A.S. 12 November 2012 [16 December 2013]. （原始内容存档于22 January 2013）. ^ Air Mauritius plans A350 Nov 2017 launch. routesonline.com. 19 March 2017 [20 March 2017]. ^ Air One orders A350s and A330s. Press releases. Airbus S.A.S. 4 June 2008 [16 December 2013]. （原始内容存档于17 June 2008）. ^ US Airways firms up order for 92 Airbus aircraft; order includes 22 A350 XWBs. Press releases. Airbus S.A.S. 5 October 2007 [30 December 2013]. （原始内容存档于14 October 2007）. ^ Rolls-Royce wins $1.8bn Trent XWB engine order from US Airways. Rolls-Royce. 18 June 2007 [30 December 2013]. （原始内容存档于19 October 2007）. ^ Russell, Edward. American converts remaining A350-800s to larger -900s. Flightglobal. 27 December 2013 [30 December 2013]. （原始内容存档于30 December 2013）. ^ American Airlines to delay Airbus A350 deliveries - Wichita Business Journal. Wichita Business Journal. [2016-07-23]. ^ Pegasus Aviation Finance Company orders two A350XWB and six A330-200s. Press releases. Airbus S.A.S. 4 January 2007 [17 December 2013]. （原始内容存档于16 January 2007）. 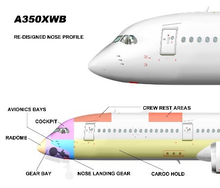 ^ Bangkok Airways selects A350 for new long range services. Press releases. Airbus S.A.S. 30 December 2005 [18 December 2013]. （原始内容存档于12 October 2013）. ^ Kaminski-Morrow, David. Bangkok Airways appears to cancel A350-800 order. Flightglobal. 6 September 2011 [18 December 2013]. （原始内容存档于6 November 2012）. ^ Cathay Pacific Airways firms up order for 30 A350 XWBs. Press releases. Airbus S.A.S. 16 September 2010 [18 December 2013]. （原始内容存档于22 January 2011）. ^ Cathay Pacific inks deal with Airbus for airline’s biggest-ever aircraft order. Cathay Pacific. 16 September 2010 [19 December 2013]. （原始内容存档于19 December 2013）. ^ Purchase of 6 Airbus A350-900 Aircraft (PDF). Cathay Pacific. 20 January 2013 [19 December 2013]. （原始内容存档 (PDF)于31 January 2012）. ^ Cathay Pacific selects A350-1000. Press releases. Airbus S.A.S. 10 July 2012 [19 December 2013]. （原始内容存档于13 July 2012）. ^ Cathay Pacific to acquire Airbus A350-1000 aircraft. Cathay Pacific. 10 July 2012 [19 December 2013]. （原始内容存档于19 December 2013）. ^ Leasing company CIT firms up A350 XWB order and adds 25 A320 Family aircraft. Press releases. Airbus S.A.S. 20 June 2007 [19 December 2013]. （原始内容存档于29 September 2007）. ^ Rolls-Royce confirms Trent XWB order with CIT. Rolls-Royce. 20 June 2007 [19 December 2013]. （原始内容存档于18 October 2007）. ^ Kaminski-Morrow, David. CIT trebles A350 order with 10 more -900s. Flightglobal. 3 January 2013 [19 December 2013]. （原始内容存档于20 March 2013）. ^ CIT adds ten A350 XWB aircraft to its portfolio. Press releases. Airbus S.A.S. 3 January 2013 [19 December 2013]. （原始内容存档于15 January 2013）. ^ Airbus and Emirates Airline agree to cancel A350 XWB order. [10 October 2014]. ^ Finnair, first airline to sign firm contract for the A350XWB. Press releases. Airbus S.A.S. 8 March 2007 [29 July 2013]. （原始内容存档于12 October 2013）. ^ Hawaiian Airlines signs firm order for 12 Airbus widebodies: contract includes six A350 XWBs. Press releases. Airbus S.A.S. 4 February 2008 [29 July 2013]. （原始内容存档于14 October 2012）. ^ Segal, Dave. $4.4 BILLION - That is what Hawaiian Airlines will pay Airbus for a fleet of planes that will extend the range of the local carrier's nonstop flights. Honolulu Star-Bulletin. 29 November 2007 [9 May 2013]. （原始内容存档于5 December 2008）. ^ Hawaiian Airlines. Hawaiian to Add New Airbus A330-800neo to Fleet (新闻稿). 22 July 2014 [22 July 2014]. ^ Kingfisher agrees to buy 50 Airbus widebody and single aisle aircraft. Press releases. Airbus S.A.S. 20 June 2007 [30 December 2013]. （原始内容存档于29 September 2007）. ^ Kingfisher places $1 billion twin Trent order for Airbus fleet. Rolls-Royce. 20 June 2007 [30 December 2013]. （原始内容存档于19 October 2007）. ^ Libyan Airlines confirms order for 15 Airbus aircraft including A350s, A330s and A320s. Press releases. Airbus S.A.S. 10 December 2007 [6 January 2014]. （原始内容存档于11 December 2007）. ^ Qatar Airways confirms order for 80 A350 XWBs and adds three A380s. Press releases. Airbus S.A.S. 18 June 2007 [6 January 2014]. （原始内容存档于21 June 2007）. ^ Rolls-Royce secures $5.6bn record order with Qatar Airways selection of the Trent XWB. Rolls-Royce. 18 June 2007 [30 December 2013]. （原始内容存档于1 July 2007）. ^ Qatar Airways endorses the larger A350 XWB models. Press releases. Airbus S.A.S. 3 December 2012 [6 January 2014]. （原始内容存档于12 October 2013）. ^ Singapore Airlines signs contract for 20 A350 XWB. Press releases. Airbus S.A.S. 22 June 2007 [6 January 2014]. （原始内容存档于27 June 2007）. ^ Singapore Airlines firms up order for more A380s and A350 XWBs. Press releases. Airbus S.A.S. 11 January 2013 [6 January 2014]. （原始内容存档于16 January 2013）. ^ Singapore Airlines finalises order for up to 50 more A350 XWBs. Press releases. Airbus S.A.S. 19 June 2013 [6 January 2014]. （原始内容存档于25 June 2013）. ^ Singapore Airlines places US$17b order for Airbus, Boeing aircraft. Channel NewsAsia. [2013-08-19]. ^ Kaur, Karamjit. SIA cuts A350 orders from 70 to 63 at Airbus' request. The Straits Times. 30 July 2015 [9 August 2015]. ^ Airbus launches new Ultra-Long Range version of the A350-900. Press releases. Airbus S.A.S. 13 October 2015 [30 May 2017]. ^ TAP Portugal orders 14 A330-900neo and 39 A320neo Family aircraft. 13 November 2015 [14 November 2015]. ^ Tunisair places firm order with Airbus for A350s, A330s and A320s. Press releases. Airbus S.A.S. 15 July 2008 [30 December 2013]. （原始内容存档于18 July 2008）. ^ Kaminski-Morrow, David. Tunisair appears to cancel A350-800 order. Flightglobal. 7 June 2013 [30 December 2013]. （原始内容存档于30 December 2013）. ^ Yemenia orders ten Airbus A350 XWBs. Press releases. Airbus S.A.S. 13 November 2007 [30 December 2013]. （原始内容存档于16 November 2007）. ^ Yemenia confirms Trent XWB order for A350 XWB fleet – takes Totalcare for Trent 700s. Rolls-Royce. 14 November 2007 [30 December 2013]. （原始内容存档于21 November 2008）. ^ STARLUX Airlines selects A350 XWB for long range services. Press releases. Airbus S.A.S. 16 July 2018 [17 July 2018]. ^ "BMW to design parts of Airbus A350 model, reportedly aircraft cabins." Forbes. 5 January 2006. ^ David Kaminski-Morrow. A350-900ULR range figure not a revision: Airbus. Flight Global. 10 May 2017. ^ Jens Flottau. Airbus, Operators Improving A350 Dispatch Reliability Two Years Into Service. Aviation Week & Space Technology. 19 January 2016.